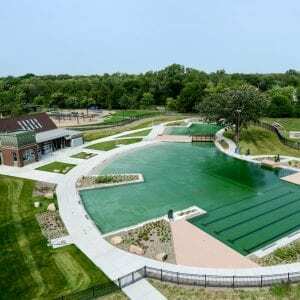 The Webber Pool is the first public swimming pool in North America to utilize a natural filtration system, using plants in a nearby pond rather than chemicals to treat the water. The pool can accomodate up to 500 swimmers with ammenidies including: a shallow depth upper pool, a mid-depth lower pool, a jumping platform, and a lap pool. All together, the pool holds 500,000 gallons of water which are recycled every 12 hours. During the recycling process, the water streams through biological filters into a nearby regeneration basin. The basin contains approximately 7,000 aquatic plants, of 36 different species, rooted in layers of limestone and granite to keep the pool clean. Work self-performed by LS Black included demolition of the existing pool and parking lot and all concrete work. Also included in the project was a 16,250 SF regeneration basin and pond, pump house, and a 2,600 SF bathhouse. As a first of it’s kind, the 22,500 SF pool presented many challenges throughout construction, including discovering a storm sewer manhole, old light pole bases containing asbestos, and unsuitable soils necessitating extraction. Partnered with the Minneapolis Board of Parks & Rec, the LS Black team was able to take an innovative approach to overcome all challenges on the project. The project was successfully delivered exceeding the expectations of both the City of Minneapolis and the community it serves.